Taking its name from the Latin word for “commandment”, Maundy Thursday focuses on Jesus’ command that we love one another and on his gift of Holy Communion. 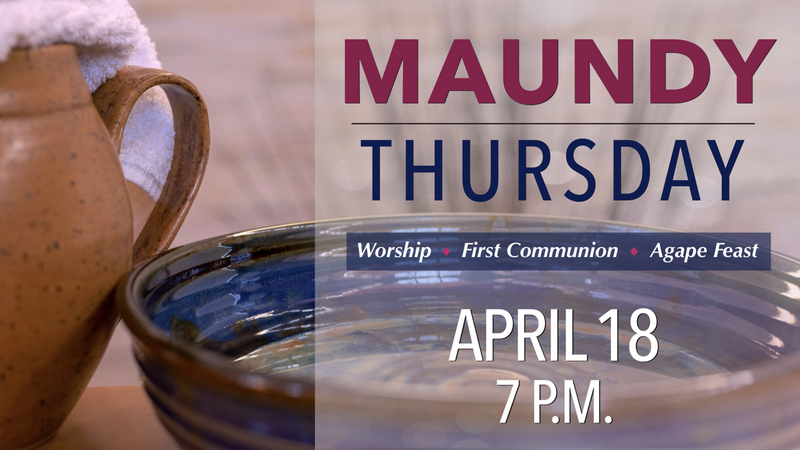 Come share Maundy Thursday with us on April 18 starting with worship at 7 p.m. Students completing First Communion Instruction will receive their first communion during worship. Worship concludes with a procession to the fellowship hall for the Agape Feast. Agape means love in Greek and the Agape Feast reminds us of Jesus feasting on this night with his friends. This candlelight feast is a beautiful, symbolic foretaste of the community of heaven. Called to welcome, nurture, equip and serve, we embrace the full inclusion of all people to share in this feast with us. RLC congregation: We need your help to make this event possible. The Agape Feast Team is looking for people to donate food, help with setup and cleanup and food replenishment. We also need to borrow artificial ficus trees. Sign up to help online or watch for more details in the Sunday announcements and on the yellow Connect Card in the weekly bulletin (starting in late March). Questions? Contact Diana Deitch or the parish office at parishadmin@rlcindy.org or (317) 881-7854.